1. 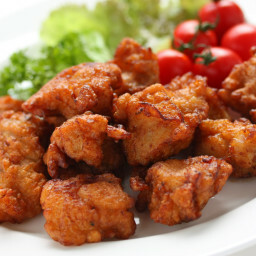 Mix together brown sugar, honey, soy sauce, ginger, garlic and hot sauce in a small sauce pan simmer while cooking chicken. This should help thicken it for sticking to the chicken strips. 2. Combine flour, salt and pepper in bag and coat the chicken strips. 3. Heat oil in a large skillet over medium-high heat. Add chicken strips and brown on both sides, about 1 minute per side. Pour the sauce over the chicken. Simmer uncovered until the sauce thickens, 8 to 10 minutes. The sauce thickened and stuck to the chicken nicely but had no extra sauce for gravy so added 1/2 cup chicken broth. Can increase/reduce hot sauce to your spicy desires.